2 whole carrots, peeled and sliced 1/2"
1 small white onion, peeled and sliced 1/4"
2 stalks celery, lightly peeled and sliced 1/2"
Rinse the chicken under cold water, then pat it dry with a paper towel and set it aside. 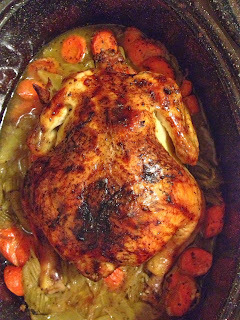 Use a roasting pan you're most comfortable with and make sure it has a cover, I use a dutch oven. Combine the onion, garlic, celery, carrots, basil, oregano, 1/4 tsp kosher salt and 1/4 tsp black pepper in the bottom of the pan. Squeeze half of the fresh orange and pour the juice over the vegetables. Toss ingredients well and spread the vegetables out evenly in the pan. Lightly sprinkle black pepper and kosher salt on both sides of the whole chicken. Center the chicken in the pan on top of the vegetables. Squeeze the remaining orange half and pour the juice over the chicken. Stuff the cavity of the chicken with what's left of the orange, peels and all! Cover and place it in the oven. Total time in the oven is 1 hour 45 minutes. Cook the chicken covered for 1 hour. Then remove the cover browning it for the last 45 minutes. Begin basting after the chicken is in the oven for 30 minutes, then baste every 15 minutes. Remove from the oven. Let sit for 5 minutes. Serve. It is an amazing and interested dish that everyone likes this dish very write my research paper for me well it is good in taste and it is also good for health by which the human body get more proteins and vitamins which is good for them and their life will be more energetic and full of energy.